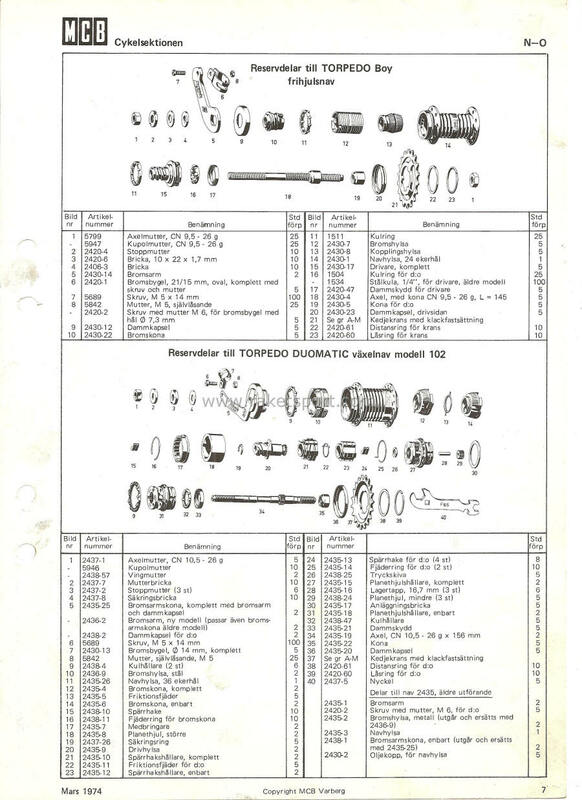 Pictures and Explosion Drawings (German): Andree Schote is the reference concerning Fichtel & Sachs Torpedo Duomatic gear hubs. – old versions (1964 – @1970) come with a 10,5mm axel diameter, two flat sides of the axle and a capped lubricator on the hub shell (Duomatic 102). – new version (@1970 – @1980)with common 9,5 mm axel diameter (Duomatic R 2110) and without lubricator. The build up of these two versions is also different. Please check exploded views. The mounting width of the hub is 112mm. Today standard frames have a mounting width of 135mm. It´s very easy to reduce the mounting width of a 135mm steel frame to serve a Duomatic. Lay the frame flat on the ground and push with your hands on one drop out softly. Check step by step the changments of width. When you reach 117mm it´s enough. The last remaning 5mm will be no problem for wheel mounting. Aluminim frames should be handeld by a bike dealer. It´s a refratory material which should be handeld with special tools and experience. 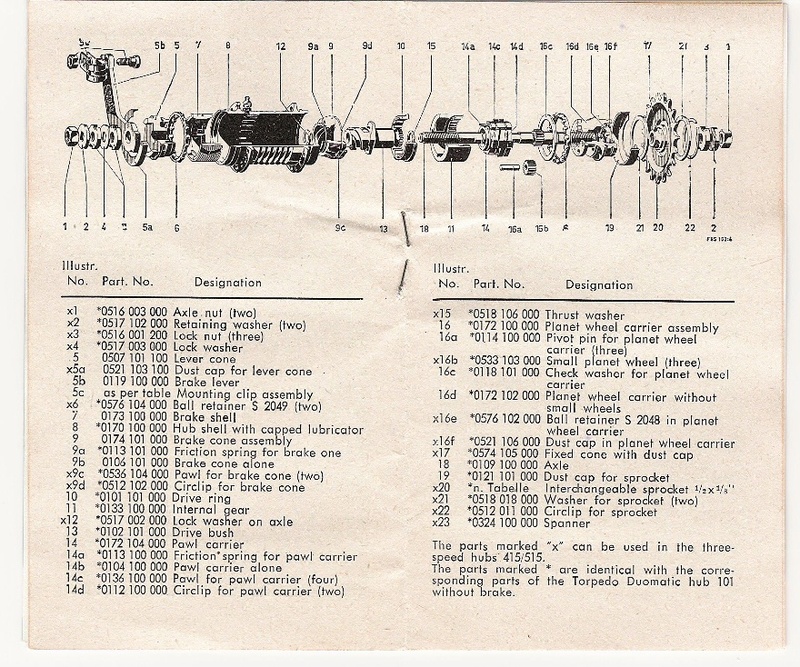 These are the original Maintenance instructions for a Duomatic internal gear hub. When you have a look on th hub shell of old Fichtel & Sachs Torpedo hubs you´ll find a letter on it. They started in the year 1958 with the letter “A” and went with each year forward. The “I” and the “Q” was not used to prevent a mix-up with the “J” and the “O”. In 1975 the letters moved on the brake lever. On the brake lever you´ll find two letters. The lower on represents the production year. The upper letter the production month. and so on. Since 1989 the production week and year is uncoded punched in the brake lever or the hub flange. These are informations from Herbert Kuner and his page www.rijwiel.net or try this are a lot of informations concerning historical bicycles and parts. Especially hubs! Another intersting dating page is Fahrradsucht.de! I have sent a couple of emails about buying some hubs, but no answer. What’s up? Any left. I would really like to buy two duomatics. there are still some Duomatics left. I´ll sent you the details! Is it atill available? Are you able to send me a picture? And does it come with nuts and washers? I would REALLY like a Doumatic! How can I get one? Thanks! I would love one of these hubs. If there are any left, please let me know how to get one. Also, on the subject of Sachs hubs, I have been having a heck of a time locating an axle for a Sachs Torpedo three speed with a coaster brake. It actually has “Bendix Torpedo” stamped on the hub shell, but it is the same hub as the Sachs. I also need a shifter, nuts, and indicator. Sturmey Archer parts are easy to find, not so with Sachs. Thanks. Please email Trevor at threespeednerd@gmail.com. I’m interested to buy you a SACHS automatic hub. I need 250-300 torpedo duomatic on a 20” wheel with 2.5 m”m spokes.please advise. what a fine idea, no cable going to the rear with that hub. Hopefully you got still on left? I sent you a note. How long is the axle? Is there any way this can be fit into a 130mm spaced road bike frame (with spacers)? I had one of these duomatics as a kid on my 20 inch bike and almost forgot about this until seeing your website! Feilx – I’ve just built a wheel on a Duomatic – in a 120mm spaced frame. The axle is about 160mm and since the drive side cone is attached to the axle there is no possibility of swapping it for a longer one. If your dropouts are thin this might be long enough – however you would have to accept a dished wheel. I wanted zero dish and had to add more spacers to one side than the other, so that there is only just enough axle on one side for the nut. OK, further clarification. Putting spacers on the drive side is a no-no. The serrated end of the cone must be right up against the dropout or the cone will rotate under load, over-tightening the bearings. Spacers on the other side are fine but will move the brake arm away from the chainstay – on my 120mm spaced frame this is fine but might be problematic on a wider frame. A dished wheel is also inevitable (even with no spacers there will be a slight dish – the flanges are slightly asymmetric); again this is ok with 120mm spacing but the dish will be more extreme the wider you go. Short of welding the cone to the axle I can’t see a way round these problems. I agree on the statments from fmackay. The cone of the Automatic / Duomatic drive site has the function of a frictional connection. Mount no spacer which will let the hub rotate here! Anything is allowed which will establish a closed linkage between the hub cone and the frame dropout. I made the best experience by reduceing the frame dropoutdistance! This sounds maybe be strange to some of you but for steel frames there is nearly no limit. I changed some from 135mm to 110mm. It´s also possible to place the two dropouts in the exact chainline position. Behind this approach stands the idea that the rear hub is the center of the bicycle! The other parts have to be built around the hub!!! Just fix your frame and work with your hands. Step by step! Measuring and testing with the hub you want to use. There are also some tools available who help you to work very accurate. Aluminium frames are very rigid! Please contact your bike dealer or try it but with a lot if sense (5mm is always possible!)! My 36 spoke Duomatic shows an “N” next to the “36” stamped in the hub.Does this mean it`s from 1970? The hub with the “N” is from 1970. Your right! I recently tripped over your wonderful blog while perusing the internet for a nice internally geared hub and it looks like I found the perfect thing in this Automatic/Duomatic hub. I Know its been a few months since the last post but do you have any hubs left in your collection? the hubs are still available (100,- Euro / hub). I received the hubs in perfect condition on friday. Very nice internal machining. I built two wheels and mounted them on my wife’s and my track bikes. They are great- perfect with a 21 tooth sprocket for hilly country. Our frames are 120 mm wide and I found you can use a 9.5 mm serrated hub nut as a spacer against the planetary cone. This prevents rotation of the planetary cone. No motion observed so far and as a former crank breaking bike racer I can produce a lot of force. I’ll keep an eye on it and see if it works well over time. For wider frames with horizontal dropouts or fork ends, a simple solution would be to have a keyed washer made. A rectangular key milled on the washer would fit in the dropout and prevent rotation of the washer. If you use Aluminum the planetary cone will bite in very well. Any machinist could make this part in a short time. Can anyone give me help with the dimensions (flange height eg) of the Duomatics? I don’t have one yet, but would like to order my spokes at the same time. The local bike shops here in Australia will not help. The industry here is based on quick selling of the Chinese bikes that last one year with intensive maintenance. The blow-up pictures seem not to have the dimensions. I’m trying to build a super bike to last me for years. I already have an old Australian-made steel frame with nice lugging. It’s a sweet ride but would be much better with the simplicity of a Torpedo and not too many of the “unnecessaries”. Great to see the info available on this hub. 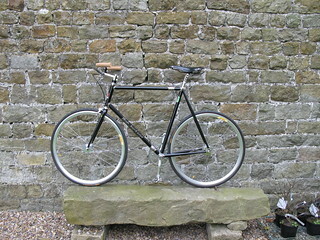 I have one out of an old Raleigh 20 from the 70’s that I found wrecked a few years ago. The hub appears fine, but will service it as per info above. Always good to have the factory manuals! As a result of finding this site, it has prodded me into doing something with my first MTB frame (steel) so it will have the Torpedo hub with an old AMP parallelogram fork. All the frame cable mounts etc have all been removed so it will look very clean and a bit retro. Will post pics when done, keep up the good work. Add say an extra 1.5mm a side for flange thickness and it all adds up to 112mm as listed above. PS don’t be too hard on the local bike shops- mass produced bikes are the way they make a living. They wouldn’t survive just just on the odd bits us bike building nutters buy from them! Any bike sold and out there may result in another possible future eccentric bike builder…..
That’s great to have. You’re right, I was being cranky about the local bike shops. I myself have been a pleased Duomatic user for years. I do not intend to damage your busioness, but somehow I do believe that 100 Euro is a bit expensive. Don’t get me wrong: Duomatic hubs are rare, they’re excellent mechanices, but… You can get them way cheaper, at least you could not so long ago. Check for instance http://www.velo-classic.de (yeah, it’s in german). Their pirce list is not very recent (2004), but when I bought a NOS Duomatic there three years ago their price was still the same as stated in the list: E 50,-. So I do not know how much profit is made on these hubs, but I would say that they deserve to be sold for a fair price! The more Duomatic users, the better the world! thanks for the information about velo classic. They have a wide range on old bicycle parts. Amazing!!! The fair price is a intersting question. I force nobody to buy a hub for me. There are sometimes interesting Duomatic auctions on ebay. This could be another source! I agree on your final statment. Every cyclist on this planet is a bright spot. I have an idea for using the 28 hole Torpedos out there on the bigger rims. Orthodoxy says a 28 spoke rear wheel will not be sturdy. But then I noticed that many mountain bike wheelsets do in fact have a 28 spoke rear wheel strong enough for going off-road. Not only the 26 inch rims, but the newer mountain 700c wheels too. Then I looked at wheels rims for smaller tyre width, and there is one brand that makes a strong 28 spoke rear wheel in 700c. I’ve also heard generally that rims are a lot stronger these days. Worth a thought I guess! I have aquired one of these hubs however it appears to stay in one gear?!?!? the brake works fine and i have opened the hub and found nothing out of the ordinary i was wondering if any one has experience with these hubs?or experienced the problem??? I have the older Torpedo Duomatic with the grease fitting and the 10.5mm axle. Do you have any axle nuts to fit? I need to re-grease my old Torpedo Duomatic, but I do not recognize any of the types of grease mentioned in the instructions. Can you suggest a modern brand or type (and weight) of grease to use? Is it an ordinary ball bearing grease (brown color) or is it a grease loaded with some additive like moly (might make it black color)? Thank you for posting the instructions, very helpful!! By the way, 28 hole Duomatics work great on city bikes with small wheels, small wheels don’t need so many spokes. you can use a standard grease for ball bearings. Use this kind of grease for all moving parts inside the hub. You need a second grease for the coaster brake. This is called a high temperature grease. It´s available from SRAM and SHIMANO. You can buy these products in every bicycle shop! Hey Marco, just wondering if you had any duomatics left mate? Interesting hubs. Do you still have any to sell? Duomatic that supposedly was never used. I changed the grease and assembled it correctly according to the great instructions on your website. I understand how it works but when assembled on the bike (laced onto a wheel, etc.) it seems to “skip” when I go for a ride and pedal hard forward. I have taken it apart many times and have understood how the mechanism works and the pieces seem to have not been used. Any ideas on why it is skipping when I pedal hard? The parts do seem unworn / brand new. I did have to make aluminum spacers with holes that are oval shaped. They slide right over the flats of the axle and key the axle to the dropouts. 28 spokes are fine in 26″ wheels. They used to be pretty common (even for mountain bikes). No need to worry that 28 spokes isn’t strong enough for a big wheel. any possiblility of purchasing a nos or rebuilt sachs kickback hub? Hey, why don’t we stop doting on the Duomatic and start making them? Would the designs still be under intellectual property protection? We could even improve it, using brass for the brake and gears (perhaps) and forging the shell and maybe other parts. Any metal workers out there? I am a beginner but getting hold of a home foundry soon…. (See the text at the very bottom of the page). Has anyone seen one of these hubs? Bought an old bike for 30€ and guess which hub it had! A duomatic 36 spoke hub. Haven’t used a doumatic since the 70’s so was really excited. Yesterday I cut out the hub from the old bike, and now the hub and my everyday commuter bike is at the bike store to be fused. See pictures of the hub. Will post some pictures later when the bike is all ready. To Harry: very good idea about the remake! Would like to see some pix of your home foundry etc. I am considering adding this to an aluminum track bike with 120mm drop outs– is it possible? 1) What modifications do I need to make? 2) Will the rear aluminum stays get shredded by the braking force? @Help! : Just put some spacers on the non-drive side. You’ll probably have to bend the clip which holds the brake arm a bit too. I’d have thought your stays would take it; I’m sure there are many Al bikes out there with coaster brakes, and track frames tend to have heavier duty stays than normal. recently scored a torpedo duomatic hub. having problems with sprocket pitch. who offers drive sprockets with pitch to fit standard cranks? Very interesting and usefull info about F&S hubs. Been looking around the internet to find info like this. I am quite new to the hub “game” but i would like to build a bike with a F&S Torpedo hub. The problem is i do not know excactly which torpedo hub i need for the bike i would like to build. Does anyone now which excact hub would be best for a city bike that is single-speed and with a free wheel and brake hub? the hubs are still available. I´ll write you a mail! the 3 speed Torpedo hub is the predecessor of the today called SRAM T3 hub. Please check the sram website for details. You can shift the 3 gears via a shifting lever which is connected by a bowden cable with the hub. You can order this hub by any bicycle dealer around your corner! The Torpedo Duomatic hub I can offer you has two gears and can be shifted by a short backpedal of the cranks. A bowden cable is not required. The pitch on my two speed sachs hub sprocket, prevents use with all my standard pitch cranks. How is everyone using their Sachs hubs? replacing with old steel cranks with different pitch? the sprockets of the hubs use a standard which is also used by SHIMANO and SRAM. So you can use all of these sprockets with all internal gear hubs. 1/2″ x 1/8″ (SHIMANO, SRAM, S&A). This means the lenght is always 1/2″. But the width of the chain is different. Most “new” cranks and sprockets come with 1/2″ x 3/32″ (also used by Shimano 7 / 8 Speed derailleur systems). You can use always the wider chain 1/8″ with a narrow crank or sprocket 3/32″ for internal geared hubs. The only problem you can run into, is to use a narrow chain with a wide crank or sprocket! I have a 1/8″ Sugino Mighty Competition chainwheel on a Camapagnolo Gran Sport road crank. It needed some spacers made out of an old chainwheel to get the chainline right. However, you can change the sprocket at the back to a standard, 1/32″ very easily. Simply prise off the circlip, change the sprocket and replace the circlip. I received my beautiful NOS Duomatic from the treasure trove and have stripped and re-greased it. I notice that after leaving it out for a few days the exterior of the hub shell shows a bit of rust. There was no rust on the shell when I finished cleaning it (using cotton cloths– nothing abrasive), so I can see rust might be a problem if it develops this quickly. Would like to coat the hub shell with something to prevent (or at least delay) rust. Would auto wax or aerosol teflon (e.g. 3M Scotchguard) help? I’ve never owned a hub with a steel shell before, so this is a new situation for me. Any ideas? Is it possible to buy the 2-speed F&S Torpedo DUOMATIC hub from you? Please kindly offer me a price including the freight cost to Taiwan. TKS and have a nice day. I´ll send you the details! Please, contact me about those 2 Torpedo duomatics. I´ve sent You a couple of mails, but I´m not sure if You have get those. I received some note from Your operator and didn´t fully understand the message because it was written in german. Sorry for the late answer. I was on “Internet Free” holidays and my out of office reply was deleted due to a server shut down! I´ll send you a mail with the details. Hit me up when you get this — interested in buying some more Duomatics! Please can you tell me if you have any duomatics left for sale.?. there is a Duomatic for sure ….for the beautiful Bob! I´ll write you a mail! Hi, I would like to fit the Duo hub in conjunction with speed drive front chain wheel. What info do you need. Thanks Paul. this combination is possible and makes sense. Paul, I think the idea of it is probably better than the implementation .. I have Speed Drives (which I like a lot), but the pairing with a kickback duomatic might be inconvenient in practice.. Moulton offered a new model with the same setup. One of my internet friends wrote about his personal experience with a Duomatic/SpeedDrive installation on his personal bike. The gear jump of the SpeedDrive is quite high at 1.65 overdrive.. here’s a sample gear inch calculation using a Duomatic/Speed Drive .. overall gear range 223% .. gear inch model = 39/53/65/88 .. with SpeedDrive in 1:1 direct drive and Duomatic in 1:1, low=39″ .. if you heel shift with SpeedDrive to ‘overdrive’, it would yield 65″.. backpedal the Duomatic yields the highest gear of 88″, heel shift SpeedDrive back to direct and you get 53″… so there would be lots of heel shift/backpedal shifting to stay in a sweet spot while trying to avoid confusion… the setup does look elegant though.. good luck with it if you press on, I also have spare SpeedDrives if interested. – are they in good condition? – what chainring is fitted? Hi John, you can contact me off list at brucemetras at yahoo dot com..
ist es immer noch möglich, bei Dir eine Duomatic-Nabe zu kaufen? Gebraucht oder neu ist egal. Hatte ein Rad mit so einer, war außerordentlich zufrieden damit, wurde aber leider gestohlen. Falls lieferbar, bezahle ich gern im Voraus. Ich wohne in Norwegen, meine Adresse kommt, wenn dies aktuell werden sollte. Do you have parts if needed? Any of those mint out of the original box Duomatics left? I want to build PISTO with Duomatic. Do you still have Duomatic? If yes, I want to purchase one. I´ll send you a E-Mail with the details. I like to by a F&S Torpedo DUOMATIC hub. Is it possible to ship it to The Netherlands? I really like my Torpedo Duomatic and now I would like to buy another one to my second cruiser. If You still have those NOS gadgets, please send me your bank details (I´ve lost those, You sent me earlier, sorry) and prize for 1 hub + shipping to Finland. Hi Marco! You have written on this page about Duomatic hubs and what versions there was. From 1964-1970 there was Duomatic 102 with 10,5 mm axel with 2 flat sides on it. I have a Duomatic 102 with the same description from 1971, so the dates aren´t right. thank you for this information. I received my information from a german forum. A former Sachs employee spread the information there. I tried to find the link but I think the tread was deleted. Are they 32 0r 36 hole? Thanks for this great site and posting the manual with diagrams! I just got a 1967 CCM GT-101 Torpedo Duomatic from my father, who bought the bicycle new in the spring of 1968. He probably put about 200 miles on it total and it has sat unused since the 1970s. It is practically mint with the exception of a few tiny rust spots that would not come off. The hub is marked F&SJ (which I learned from this site gives it a production date of 1967). It is the 36 hole version. I cleaned it out and reassembled it with new lubricants. It works perfectly as does the coaster brake. Now, for my technical question. The bicycle has a 46t chainring and the hub has a 19t cog giving an input ratio of 2.42. Given that the wheels are 700C, this makes the gearing quite tall, e.i., the 1:1 ratio is perfect for cruising and commuting but the 1:1.36 gear is too high to be useful to me. I have a fair number of hills to get up so I am considering swapping out the 46t chainring for a 36t. This would make high gear perfect for commuting on the flats and leave the 1:1 gear for start-ups and the hills. However, it would mean an input ratio of 1.89. I was about to go ahead until I read a story about a guy who has had problem with axle spin on his racing bicycle with a 46t/20t duomatic. Somebody wrote in and said that the Torpedo Duomatic with the round axle can’t handle any less input ratio than 2.4 as this is too much torque for it. Can anybody confirm that I will have problems with axle spin if I do go with a 36t/19t on this hub? Is anybody having problems in this regard running less than 2.4 input? I got the bike to commute but if I can’t gear it down, I will probably just repace the hub with something like an SRAM 7. I geared down for the same reason and also read the blog post at http://www.powderblueorbit.com/2009/02/sachs-torpedo-duomatic-hub-issues.html. FWIW, I’ve had no axle spinning issues with 38×18 (the sprocket is for a Shimano hub) using the standard F&S nuts in the first 100 miles. Thanks for the info. Upon further inspection, I seem that my axle is not round is a 10,5mm axel diameter, with two flat sides on the axle. That probably solves the axle spin problem. Do you think I would still have a problem with wheel slippage? Also, I read that using a non-Duomatic cog can lead to slop as these cogs are a little different than standard cogs. That is why I thought to replace my chainring. However, has anybody here had problems with using different cogs on the older vesion of the Duomatic Hub (pre-1970)? If the Fichtel & Sachs (F&S) Torpedo DUOMATIC is available on the Pashley guv’nor, doesn’t that mean they are manufacturing it again? I doubt they sell it with new old stock parts! We want bikes for the rest of us! It seems to me like a limited edition. Are these hubs still available & how much for hub & postage to Sydney, Australia? photo. The teeth on the cone will not grip a steel washer. and hopefully he can post it on the website. is that I do not have any axle slipping or spinning problems. I’m not a super strong rider, but I do ride out of the saddle. thanks for for sharing your NTWD “Non Turing Washer Design” for the DUOMATIC hub. Have you any Duomatic Hubs left for sale please? My Torpedo Duomatic delivery has just arrived to Finland and it seemed to be ok. Although the package was covered with oil!! !, BUT I think that´s not from my hub. Let´s see. Thanks anyway. One question. I found an old Torpedo hub with only text near oillock: F&S TORPEDO ZWEIGANG. There are no other marks. Any ideas, what it might be and would it contain gears? I wish you a lot of fun with the hubs. “Zweigang” means in German “two gears”. There should be two gears inside. Maybe you can send me a picture for more details! I have a Columbia Twosome with a Sachs Duomatic Hub. It is marked with an “O” indicating 1971 production. However, it has a “2 flat sided axle” and lubricator cap common to the ’64-’70. The lady I bought it from said her dad bought it in the early to mid ’60’s (I realize this could be ambiguous info), but what about the other info? Well, after previously using a Duomatic in a Moulton Stowaway, I found a 36-hole model, and was going to build it into my Kronan city bike to replace the singlespeed. However, my friend John built a fast road bike with a Duo, and I was so impressed I built one too! …however, my joy was short lived, as the rear wheel locked up solid about 100 mtrs into the first ride. I now need to investigate, but first, has anyone a quick idea of what the problem might be? Please let me know if you have any Duomatics available for sale. Thanks! I have a 1967 F&S Duomatic hub with the original 18t cog. I switched it for a 22t Shimano cog off of a Nexus-Inter 3 hub and it is a perfect fit, even a little tighter than the original. I thought I would post this info because I had read a report that the Shimano cogs were of sufficiently larger internal diameter to create slop, which was not my experience. I love this hub! It spins so freely even after 42 years (though I did overhaul it with new grease after a 25 year hiatus). It is strong enough to lock and skid the back wheel as well. My new SRAM S7 coaster brake has better modulation but it is also brand new. Both get warm when used to decelerate in the montains but not overly hot. Seems Sturmey is coming out with a new version of the much vaunted Duomatic. I will be getting one to put on my road frame, instead of my current Shimano CB-E110. I have a question for you Duomatic afficionados. I want to add some oil to the oil port on my 1967 Duomatic. The instructions say: Esso Universal Oil, Shell Donax H, etc. Obviously, these oils are out of production. How heavy an oil do you guys add to the oil port? I am thinking to use Mobile 1 0W-20 since I live in Canada and it is cold here most of the time. Any suggestions are appreciated. I have a Peugeot Porteur (1970/1072) with a Duomatic hub (I’m not sure). In the middle of the hub there are two numbers: one is 36 (the number of spokes) and a 2.8. My question is about this: what is the meaning os 2.8? the 2.8 stands for 28 and this is the amount of spokeholes. There are also 36 spokehole hubs available. Carlos, I’m guessing here, but after measuring, 2.8 (mm?) is very close to the spoke hole size on my 36h Automatic hub. I’m rebuilding a vintage step through frame for my girl. I’ve been searching for nos coaster hubs and recently came across a guy selling both the Sachs Duomatic and Bendix 2 speed (yellow band). Aesthetically I preferred the Bendix but it was significantly more expensive. Wondering if you have an experience with them and could offer a comparison with the Sachs Duomatic. I have no experience with the Bendix. Therefore I cannot support you with a comparison! I was wondering if the ‘Duomatic 102’ can be spaced-out (with washers) to fit 120mm OLN dropouts, or do you always have to re-set the frame? Do you have a 36 spoke Duomatic hub for sale? I’m trying to re-create the special I built when I was about 14-15. Im interested in putting together a 2 speed wheel. Let me know what you have if there is any left and how much. I found a sachs automatic hub and cleaned it up. I was thinking of using hi temp disk brake automotive grease to grease the whole hub. Does anybody know why you are supposed to use two kinds of grease as opposed to just the high temp? I have a duomatic, NOS that’s been repacked and laced up to a nice DT Swiss wheel. The problem I haven’t solved so far is that as I ride, it locks up – as though I had hit the brakes. It happens in either gear. Also, I want to give a special thanks to Marco. I had a slight problem with the rebuilt hub. I contacted Marco, and he was very responsive in taking care of the problems. Nice to deal with gentlemen in this world!!! I have a 1965 Old Duomatic, it has recently started to slip into neutral gear when shifting to the 1:1 ratio. Everyting else works OK still, no bearing play or noise. I’ve looked at the manual, but nothing on adjusting the gear itself, just the bearings. Are you able to take the hub apart and inspect it? There is no adjustment per se. You need to inspect the parts to see if something broke. The diagrams that are available for download on this site work very well. If you need spare parts, Marco knows someone who has them. I am no expert on these things, but I have been successful in rebuilding one recently. It wasn’t that bad. From the looks of the hub internals it would seem that the 1st gear is implemented just by normal ratchet – freewheel mechanics. They have tendency to get stuck over time especially if they have been greased with grease that has later on immersed water. This first starts to happen at cold and later on warmer and warmer. For any other hub I would leave the ratchet totally dry but for these babies I would use oil. I hope you already got the thing fixed. Yes, I can take the hub apart…a job for the weekend. It is a new old stock refurb from Moulton which worked OK for about 15km, so I’m hoping it will just be an assembly problem rather than wear. Do you still have these Duomatics for sale? sorry but there is no hub left! When you refer to me he will definitely have a hub for you. Do you still have any 36 hole Duomatics left? I’m very interesting in two if they are still available. Thanks! Sorry Superlight, I have no hub left! I was looking for contact info for Marco. I can’t seem to find the correct address. Does anyone have it? About 6 months ago I bought a brand new Duomatic hub (one of the last series) still in the box and wrapped in oil paper for Dkr.200. about £20. Today I was out at the same bike shop and bought a used one (from the first series) for Dkr.75. about £7.50. Despite it being from 1967 it still works perfectly. Both hubs are 36 hole. The first hub is built into a wheel on my cruiser and the second one will also be used on my wifes cruiser. Hi,I have a Duomatic from the late 80’s. The problem I am having is after pedaling couple times the locknut starts tightening against the brake cone to the point where the wheel becomes very hard to spin.I did assemble with the bottom locknut loose according to instruction. The locknuts on my bike are just regular thin profile nuts it is not the type with square notch which require a special tool to remove. What am I doing wrong please advise. Thanks. IS this hub a 2 speed that you are sellin …how many spoke holes ..is it a 36 spoke model or not ?? 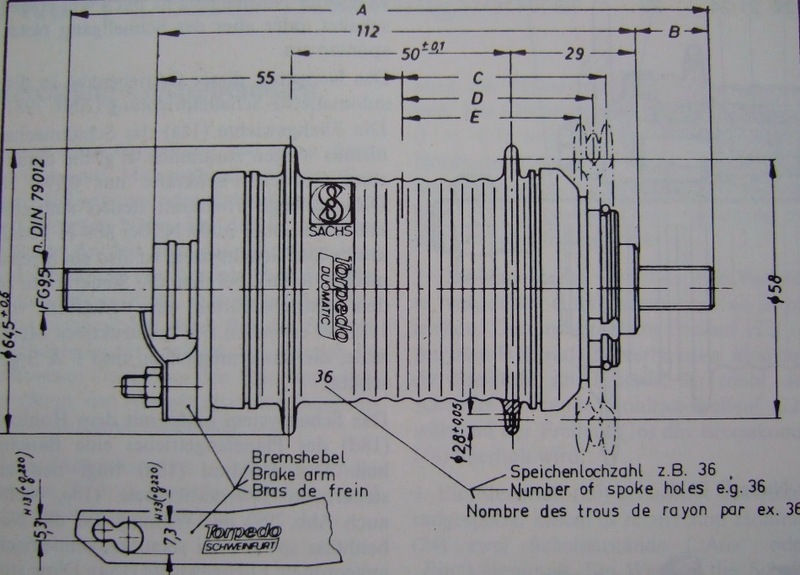 I am looking for an older 36 spoke 2 speed for my Swedish Military Bike …these came originally with the torpedo hub ..just not a 2 speed ..this would look stock on my bike the older the better …my bike is pre WW2 model. Theese hubs are not rare in Denmark. 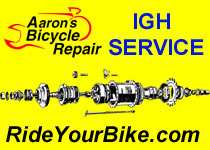 Used hubs are often found in bicycle-dealers waste – which is a shame since they are allmost impossible to wear out. I have an Auto and a Duo, would anyone know what cogs we can substitute for the original? I need to change the 19t for a 20t or 21t. You can fit any size you want. They’re easy to change. What I was referring to was the type of cog, does it have to be sturmey, shimano, etc. as I have heard that some have a little play when put on the Sachs hubs? I have a 1968 Duomatic hub that has the oil fitting. Does anyone know where I can find an oil syringe/tool so that I can add oil into the fitting? I have been using a syringe from my ink jet catridge refilling kit. I used sharp pliers to cut of the metal end and there was still enough of the plastic tip at the end of the syringe barrel to fit tightly against the oil fill hole with moderate pressure. Works perfectly – no mess. i have a duomatic with 36 hole for sale. im looking for 100euro but still open for offers. Oh, great page, I hope it stays up forever. I have an old 20″ wheel with a Torpedo Duomaitc hub marked “S&F K”, which I think means 1967. The brake lever, is unfortunately bendt and the internal parts seemed to have rusted stuck. However, after some cleaning and oiling a lot with spray can oil GT85 and left over night it does turn smoothly. I wonder what the chances are to get a replacment brake lever (brake arm? ), or perhaps even a faulty hub for spare parts. With a bit of luck it still might just need cleaning and oiling. I would love to find an old old bike to fit it on. You have a Duomatic 102, which is the best one. Is the brake arm bendt? How did you manage to do that? I hope you mean number 5 on the picture? PS. Are you from Sweden? Your nick is a name on a town in Sweden. I’m in Norway, and it’s my name. The wheel is form an old DBS bike combi, a bit like a moulton or a Raleigh shopper. The bike was stolen, and found again a year later at a construction side, all rusty and taken appart. It is still there, front wheel missing. I only brought the rare wheel back home, thinking I might use it again. The wheel is pretty much intact, but it looks like the brake arm has taken a blow and is slighly bent inwards towards the spokes. I haven’t figured out a way to open it to see if more is damaged. However it turns fine. Yes, I mean number 5 on the picture. I’m looking at old bike tools on ebay.uk and ebay.de for the right kind of tools for this hub. He has parts to all norwegian bikes. if anyone interested let me know. I have a newer version R 2110. The sprocket side planet gear is fixed onto the axle but when assembled the axle is not centered in the hub. Has anyone successfully moved the position of the planet gear, and if so how? I have just bought the last new 36H Duomatic R2110 from Moulton in the UK. I don’t know what year it is but it has 890 on the brake arm. I need axle nuts and a drive side dust cover.. Can anyone help? Also, what size is the thread? OK I’ve found the thread size “FG 9,5” (a German bicycle standard) but not yet found a stockist in the UK. I’ve recently acquired a pristine previously owned Pashley Guv’nor, 22.5″ frame Plus Four No.20 of the 50, made in 2009, with the Sachs Duomatic and Schlumpf Speed Drive set-up. Would be pleased to hear from any other Guv’nor Plus Four owners. I’m compiling a Register, located 18 at the time of writing. The Duomatic hubs used by Pashley were NOS. 2 oldversion-duomatics for sale, more information at bikereparation@gmail.com. For a friendly price. where can I buy 10.5 mm axle nuts? I have serveral 36 hole F&S Duomatic hubs for sale (type R2110 and 101). -The used ones are €60 and are checked/ recreased. -The New Old Stocks are €90,- each. I have a Sachs Torpedo on an old bike, but it hasn’t got any Duomatic or Automatic written on it. Should I presume it’s a single speed hub with coster brake? Yes you can almost be sure, there are lots of Torpedo singlespeed coaster brake hubs around. However, I have come across old hubs which have had the brake arm bendt or replace for some reason (where the duomatic brand showed), and the only thing embossed in the metal have been “F/S Torpedo”, you never really know until you test it. If the axel has a hole for a wire, it is a three speed. I’ve seen a few converted to a singlespeed, but all parts have remained in the hub and it was easily fixed. How much are you asking for the hub? hello Joe, i am asking 50 euros + shipping costs. Joe please contact me via email, csepel71 et gmail dot com. I have one of these with a 10.5 mm axle, and was curious, is it possible to run one of these without the brake assembly safely, and without the axle turning in the frame? Inquiring if anyone has any hubs for sale, possibly duo or auto with washers and nuts? have 3 perfect and complete duomatics on ebay. What is the diameter of the hub? got 4 duomatics for sale, shipping worldwide, hubs are in excellent condition inside and outside, complete with all the necessary parts, 140 usd each, 28 and 36H hubs as well. then made in Germany. Is the hub a 1969 or is it a different year? What is the lowest tooth number cog that can be used on a Duomatic without the chain causing problems? I have a 16″ wheel Hi-Lo bicycle with a 52t front sprocket and it’s still geared too low for my taste. I put a smaller cog from a Komet hub onto the Duomatic and it fit, but the chain wouldn’t seat because it was hanging up on the dust cover of the hub because the cog was so small. It appears a SRAM cog will fit if I know the smallest functional size. Thanks for any advice. Nice site, I found an old Stokvis Ladies bike (Dutch) recently. Barn find. Walking it to the car I noticed the nice tick-tick-tick from the rear hub. Not something you normally hear on a coaster brake. So getting home I checked the hub 🙂 an old version Duomatic. Works great. Funny enough the hub is marked “36 O” meaning it is a 1971… I concluded it is the old version because of the oiler on the hub. Did they continue the old version till 1971? (you mention on the site till 1970). Continue the good work and thanks for the documentation. My 1967 duomatic didn’t have a connection between the frame and the brake apparatus. My bike locks up when I go to apply the brake. What do? I have a large amount of parts for Duomatic, Dreigang and one-speed Torpedo hub. Let me know if you need some parts. The brake cone of my original Duomatic (part 0106 101 000) has no round hole underneath to take the spring from the pawl carrier (the spring normally fits into this hole). I don’t think the hub had ever been apart until I stripped it and I don’t know if it worked. There is only one type of brake cone as far as I’m aware – could I have a faulty part? Do I need to get a replacement brake cone with a hole? If so, where from? Thanks. What is the best/correct oil currently available that is suitable for the Duomatic? Il nostro Studio ha 10 anni di esperienza nel sviluppo di siti internet e di prodotti di poligrafica. Le proposti che proponiamo sono orientate alla massimizzazione della conversione e all’aumento delle vendite. La nostra funzione non e solo la sviluppo e il design: ogni nostro lavoro porta con se le precise idee che vanno trasmesse dal venditore all’acquirente. A seconda degli obbiettivi stabiliti dal cliente cambiano anche le nostre soluzioni. новости беларуси свежие	Подробности по ссылке…. I suspect that the last post, from Hag, is designed to take you to an unsafe site. No way I’m going to click on the link. I advise everyone not to.